Figure 7.16 "Lead snowstorm" from .30-30 hunting bullet. 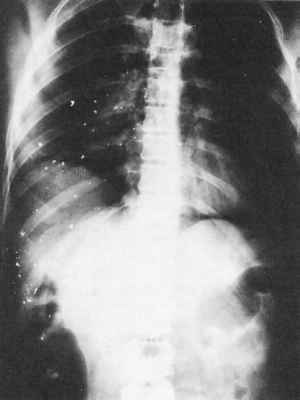 of an x-ray almost always indicates that the individual was shot with centerfire hunting ammunition, absence of such a picture does not absolutely rule out the possibility. The lead snowstorm from hunting ammunition is dependent on the velocity of the bullet. If a rifle bullet is traveling at a low velocity, either because of extreme range or having been slowed by passing through various other targets before striking an individual, x-rays will not show a lead snow-storm. It must be stressed that a rifle bullet does not have to hit bone for a lead snowstorm to occur. A gunshot wound of the head from a high-velocity handgun bullet — typically the .357 Magnum — can produce an x-ray picture superficially resembling the lead snowstorm of hunting bullets. 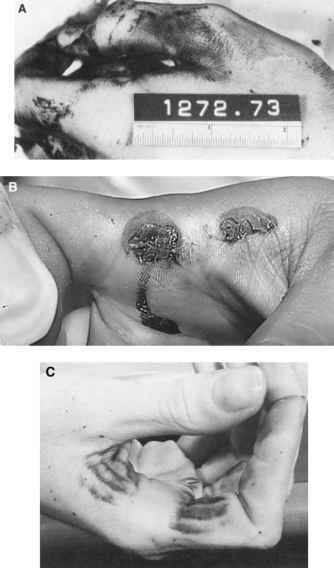 Breakup of the handgun bullet, however, requires perforation of bone which is not necessary with a rifle bullet. The fragments produced by the handgun bullet are fewer in number and larger. Lead dust is also not present (see Figure 11.5). An x-ray of an individual shot with a full metal-jacketed rifle bullet, with the exception of the M-16 cartridge, usually fails to reveal any bullet fragments at all even if the bullet has perforated bone such as the skull or spine. If any fragments are seen, they are very sparse in number, very fine and located at the point the bullet perforated bone.